Before you can move onto the decor, the hors d’oeuvres, and the music, you’ll need to lock in the perfect venue. However, regardless of whether you’ve hired an event planner or are running the show yourself, this is often the hardest decision you’ll have to make while organizing an event. To ensure you choose the ideal space, ask the following questions before making a reservation. 1. What’s Included in the Price? While you might be enticed to choose a certain venue because you heard they had a projector or offered an in-house event planner, it’s important not to expect any add-ons. Ask the event space what fixtures, supplies, and services are included in the price. In some cases, they may only rent out the building — even charging extra for chairs and tables. If the venue doesn’t include services you require, make sure you can hire outside vendors to provide them, such as an event planner to decorate the venue or a DJ to soundtrack the event. Whether you’re planning a sweet sixteen or a corporate conference, most people expect to have Wi-Fi access at events in this day and age. While some venues might offer Wi-Fi connectivity for a fee, others may not have a router at all. Make sure to clarify this beforehand, especially if your event involves networking, presentations, or social media invitations. 3. What Are Your Policies Regarding Payment & Cancellation? When you’ve decided to commit to a specific venue, clarify the accepted forms of payment and the timeline you’ll be expected to follow. Some venues may require a deposit in advance (such as 50% of the total booking fee) to prevent clients from pulling out. In this case, you’ll have to work the payment schedule into your budget, ensuring you have enough to cover the other half once the event is over. It’s also smart to ask what will happen if you have to cancel the event. Should a family member fall ill, or the wedding get called off, you might be required to pay a percentage of the total cost even if the event never takes place. If you’re hiring an event planner, caterer, or other outside service, make sure to check their policies regarding payment and cancellation as well. If you’re looking for a venue that will impress your guests and create the ultimate atmosphere for your event, consider Saint Louis Alumni Association. This all-boys, K-12 private Catholic school in Honolulu, HI, offers a clubhouse for their esteemed alumni, which can be reserved for everything from class reunions to weddings. 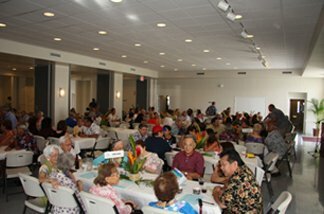 If you’re interested in viewing the space and working with an event planner, call the association at (808) 949-6633. You can also visit them online to browse photos or learn about becoming a member.